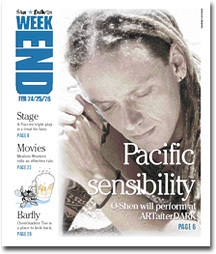 O-Shen says "it's an honor" to be the headliner at this month's ARTafterDARK at the Honolulu Academy of Arts on Friday. It's also apt for the aloha he has received from the local music community since his first album, "Iron Youth," won a Hoku award in 2001. » Place: Honolulu Academy of Arts, 900 S. Beretania St.
"It's such an honor to be accepted and welcomed musically in a community that doesn't let in hardly anybody from foreign places. Not only that, I am from another island, but still I'm Caucasian, and that's always been a surprise to me," O-Shen said in a phone interview last weekend. O-Shen grew up in rural Papua New Guinea as a native-speaker of Niugini pidgin, the official national language. He is also a native speaker of the regional dialect spoken in his village, as well as other dialects spoken across the island nation. He is also a keen student of the regional differences found in the Hawaiian language. 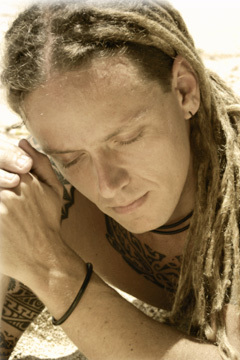 Although much of his music utilizes rhythms of Jamaican origin, O-Shen is making increasing use of Niugini pidgin and his regional languages rather than English. That's not as big a stretch for the local market as it might seem, since Niugini pidgin has evolved over decades of occupation by the English and their colonial proxies. It has enough similarities to the Jamaican patois and pidgin English here that most local listeners can get the gist of "Ektin Fensi," one of the songs on O-Shen's current album, "Faya!" He says that the response to the album thus far has been positive, even though only seven of the 15 songs have any English lyrics. "I didn't know if it was going to be accepted or if it was going to be way too foreign for the ears, but, surprisingly, I'm getting really, really good response. It makes me want to incorporate more of the dialects that I'm exposed to and maybe inspire the other artists out there to dig deeper with their music and their writing. So much of what is being written here -- 'I want to hold you all night.' It's always about 'tonight.' We've heard it a million times. 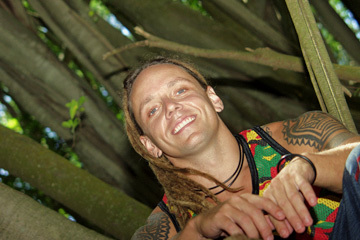 "The first person who comes out with some sort of mix of traditional (and) contemporary types of music, while using more modern instruments and incorporating the (Hawaiian) language, and using maybe some more modern and international-influenced rhythms, will definitely, I think, have a chance at bridging over ... and maybe even becoming popular in other parts of the Pacific. "As long as English dominates the music in Hawaii, it will stay local. The local reggae will stay local reggae." O-Shen, who grew up in Papua New Guinea, employs the Niugini pidgin in his music. He disagrees with the common view of falsetto and slack key styles of Hawaiian music as "traditional," saying they are other forms of contemporary music. O-SHEN DEFINES traditional music as pre-Western contact -- everything after that is contemporary, although some of it is now considered "traditional." "I respect (and enjoy) that style of music. ... But I get very kind of irritated when I hear people talk about the standup bass and ukulele and falsetto music as traditional Hawaiian, 'cause to me those instruments are no more traditional to Hawaii than the electric keyboards and the drum set and the microphone, because they came after Captain Cook (and) after contact with Europeans. I respect it as a form of contemporary music that's a very, very hard type of music to play. I love it for what it is, but I don't consider it Hawaiian in a traditional sense. In Papua New Guinea, we have that style of music, too ... but we don't look at that as traditional. "The only thing about it that is more Hawaiian than (Jawaiian) nowadays is that they actually do use the language ... but I think the drum rhythms are the heartbeat of all island music." The theme of this month's ARTafterDARK, "Voyage to the South Pacific," ties in to the academy's new exhibition. "Life in the Pacific of the 1700s" contains several hundred items that were collected by Captain Cook between 1768 and 1779. There are 35 items from Hawaii, and a larger number from Tonga, Tahiti and New Zealand. The Marquesas, Vanuatu (New Hebrides), New Caledonia and North America are also represented. "These are things that were taken from the islands during its purest time -- before they even had metal tools to create these things. I think that's why it's such a big thing for people to come and see these artifacts," O-Shen says. "I can't believe they chose me (to perform), being that I'm more related to Papua New Guinea -- I mean, New Guinea wasn't even one of the major islands that Cook explored. ... Maybe it's because my music represents more of the Pacific as a whole, and there's not a lot of artists based in Hawaii that do that." COINCIDENTALLY, O-Shen recently finished reading "In the Wake of Captain James Cook," about the explorer's three voyages to the Pacific and how the artifacts were collected. "I think this gig is a good opportunity for me. I think people need to reevaluate what is 'traditional.' This whole gig is to honor those traditional artifacts that come from a traditional time, and I think the whole community needs to reevaluate what is really our traditional music and what is our contemporary forms. I think falsetto and slack key go right next to reggae and hip-hop and any other kind of music that is a contemporary form, (but) they've been around for longer and they're more respected and they're taken more seriously. "I'm not here to bag on that kind of music or anything. I just want to alert people -- love it for what it is, but don't call it traditional." Taking a long-range view, O-Shen supports the efforts of artists here to write and record contemporary music in Hawaiian -- he prefers the term "Maoli" -- rather than English. "I'd like to, in the future, start to get evolving my live show to be more on the Pacific language style of music, and take out some of the more hip-hop English style of songs. ... But I'm really surprised to see Hawaiian people coming to me and giving me positive feedback. Even though they don't understand the dialect, they feel a connection. "All I can do as a singer is try to raise awareness, and try to preserve something that I love, and that's the culture and the traditions of the islands."